Modern workforce implies that everyone’s job is fast-paced and a little overwhelming. Today, everyone has to crosslink their job not only with teammates but also with multiple levels of management and stakeholders and keep in touch all the time. To keep track of work, all of us need some sort of task management system. As a vendor, we get tons of free R&D by simply communicating with our clients—different teams across the industry map. The most frequent requests concern the cross-functional tasks shared by multiple team members. Millions of workers across the globe still use Excel spreadsheets for project management, spending hours on tasks that take minutes with other solutions. “Why do people still use Microsoft Excel for project management?” is one of the more frequent questions you’ll find online in conjunction with PPM tools research. Old-school task management has the same problem now as it had ten years ago—too many inputs to keep track of. Only a real savant can keep track of everything at once. For an average person in 2018, keeping track of the everything at once with the help of Excel spreadsheets is like having a list on sticky notes. Things get lost. Task remain undone. Schedules break…and don’t even start with the budget. So why do people still risk it all with Excel? The simple answer is that most people are used to it. This familiarity with Excel spreadsheets makes it the most popular and, at the same time, the most dangerous ppm tool there is. There’s absolutely nothing wrong with it. Excel is still the best tool for number crunching. However, it wasn’t designed for project management in the first place. Therefore, using Excel spreadsheets for tracking your project bid and budget, and managing the overall project is counterproductive. Use it where it makes sense. After Excel, the attempts to digitize your timeframes and budgets go straight to Trello and Wunderlist. These are wonderful tools for a scale of 5 to 10 employees and 3 to 5 projects simultaneously. But again, with these solutions, you can’t communicate well with your team, even the five of them. 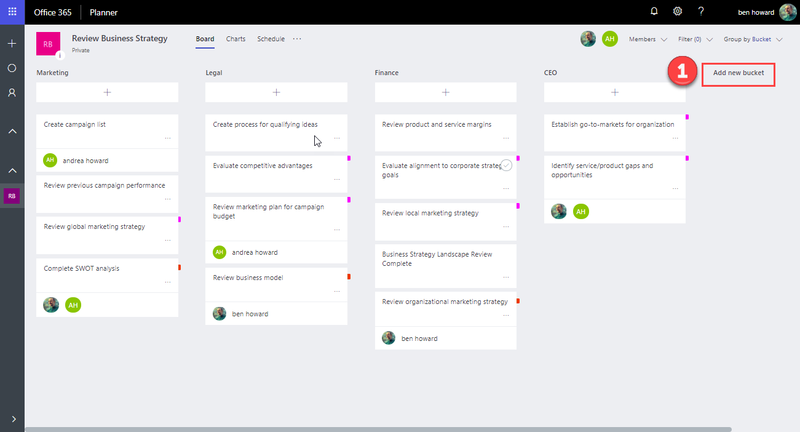 Before migrating to Office 365, people usually go with (or rather settle for) OneNote or Wrike as an ad hoc task manager. What awaits you and your team in these cases are humongous tables with lots of columns, checkboxes, and hyperlinks. New and new tabs for specific projects or people, more and more lists, complicated color-coding, and with tags, it goes straight to “ridiculous” in one month. Tasks, unfortunately, still get lost or misinterpreted. When your team is distributed not just across an open space, but across the country, or even the globe, you have many simultaneous projects and deliverables in process at any given time that you have to digitize. By choosing the appropriate tool for the job, like Microsoft Planner—with the ability to attach and share any file (Excel included)—you can keep your budget spreadsheet in context with your timetables while getting the promise of the highest level of quality and intuitive, easy-to-use interface. More so, Planner provides four main functionalities that a perfect project management team needs. 1.Check Email, Teams channels, and Groups for new assignments. 2.Add those tasks to Planner with a description. 3.If you’re in a position to distribute tasks, you’ll assign them; otherwise, you can leave them unassigned until the team can sync up. 4.You can create sub-steps or deliverables required for the task and use the checklist in the Planner card to make an itemized list. 5.By keeping all the documents in SharePoint, you can take the links sent to you and add them to the task (In case someone sends an attachment, you can drop it into the appropriate SharePoint location and create a link.). 6.Once you’ve created a task in Planner, you can check the progress and respond to an originating email. 7.In case more than one person will work on a task, Microsoft has an option of assigning tasks to multiple people. You don’t have to duplicate tasks anymore. Communicating about tasks with your team can sometimes be a tricky proposition. Planner has solved it with comment section on every task card and Teams integration. When you leave a comment there, you begin a conversation in your Group’s mailbox, which is broadcasted to everyone in the Group. Planner also gives some functionality you don’t realize you need until you try—namely, a way to see if any of your team members are overloaded. The planner provides soft analytics to help users balance workloads and monitor productivity. It is useful not only for project managers and team leads to show off team’s productivity to the bosses, but also for the teammates to understand the workload spread. The most important is that by simply looking at the Charts overview in Planner, anyone can quickly assess what is going on with the whole team and the whole project, who has a lot going on, who doesn’t, and if any projects are late or pushing the limit. By keeping track of the “big picture” on any project, you can not only identify issues and reprioritize, but also foresee and prevent them from occurring in the first place. Portfolio management is the next step in the evolution of any business. When you’ve finally gotten every team and project up and running, there’s space to grow–the number of clients, the number of employees, and even teams. Subsequently, there’s room to grow the number of products, services, and as a result, the number of projects to monitor and manage. Most definitely, the decision to grow depends on your vision and “Master Plan.” But more often than not, people decide to grow rather than stay the same. The trick here is to make changes in your toolbox as you do. When you need to track not just several projects, but progress on several project groups. For example, you have a chain of restaurants or shops, and you have simultaneous openings of new locations. This means you have to manage multiple projects at different stages of completion, with separate teams involved. And in each group, you’ve got 10-15 projects. This is when portfolio management tools come in handy. They are specifically designed for you to see the big picture like “How’s our marketing doing?” with a way to get into details on each of them, if needed. “Home-based data” – a single, secure, and easy to reach location where you can to see everything at once. You wouldn’t need it unless you like drilling down into every single item, as if you’re looking for oil, to get to the point. Otherwise, you wouldn’t mind having all your ducks in a row within the same place. Workload assessment – You need to understand the team’s workload; your boss needs to assess your workload and budget. Using Planner in conjunction with Teams can organize your timetable and workload easy as pie. You get things done and your reporting becomes flexible, up-to-date, and employee-friendly. In cases when your business is moving toward progress (you’ve got yourself Planner when you needed it, didn’t you? ), the logical thing to do is to sync the evolution of the business with the evolution of technical capabilities to support your growth. That is just a polite way to say that if you need to manage the tenth of groups of projects, Planner won’t do anymore. A logical continuation for your equipment strategy would be tools that are designed for more projects in the same chart or dashboard. And luck is on our side, because we don’t have to forsake the solutions we’ve learned to use, gotten used to, and almost love by the time they’re no longer enough. For example, we still can use Excel spreadsheets to integrate the data from Planner into Project Online. And there is more than one ergonomic solution for incorporating all your toolbox items into one concise picture. Let’s say, you’ve worked with JIRA, VSTS, SharePoint, ServiceNow, and Salesforce, but not Planner. The reality of modern organizations is the use of multiple tools for portfolio management, project management, and work management. Top management and PMOs are facing the great challenge of getting a view of the full picture of the projects instantly, without manual data extraction and aggregation. That’s when FluentPro’s Integration Hub comes in handy. This platform is specifically created to ease the pain of connecting portfolio, project, and work management tools into one wholesome and continuous data stream. And if you started with Microsoft Planner and progressed to Project Online, you still can get all the pieces together. No matter what you’ve used in conjunction with your Office 365 solutions–Planner, Groups, SharePoint, Dynamics 365 PSA, VSTS, JIRA, CA Agile Central, ServiceNow, or Salesforce—Integration Hub will take care of your portfolio management and reporting.